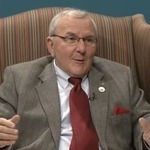 Known as "Dr. Bob", Squatriglia contributed to Coastal's growth through his position as Vice President for Student Affairs at Coastal for over three decades. He tells about his meeting Dr. Singleton (Coastal Chancellor), his early years at Coastal and establishing a student center and the first residence halls on campus. His accomplishments included establishing minority student relations, an honors convocation, veterans affairs / association, numerous student awards and honors, and dealing effectively in many ways with the growth of the campus and student enrollment. Squatriglia, Robert W. and Tomczyk, Charmaine B., "Robert W. Squatriglia, oral history interview, Part One" (2016). The Coastal Carolina University Oral History Project. 8.